This review first appeared in the September 1, 1995 issue of the North County Blade-Citizen (now North County Times). 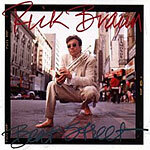 Rick Braun plays an accessible jazz-inflected instrumental pop in a vein similar to the easy grooves of Bob James, Earl Klugh or Kenny G. He's got a rich tone on his trumpet reminiscent of classic Herb Alpert, and his songs are hook-laden pop-dance numbers ready for radio. While it's pleasant enough, and while Braun is a talented trumpeter with some impressive playing throughout, there's a lack of any sense of passion here.